Layered bob style haircuts look good on most face shapes and with most hair types. The bob has been a popular hairstyle in recent years – especially among celebrities. With a variety of cuts to choose from, layered bob style haircuts are definitely becoming an ‘in’ thing. If you’re looking for a good, medium-to-short length hairstyle, try a bob cut today. A carefree and casual bob is perfect for those who are on the go. The choppy layers can be razor-cut to give movement and when paired with an asymmetrical fringe you’ll look breezy and beautiful with little hassle. 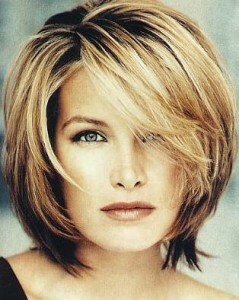 Put choppy, stacked layers in your layered bob style haircut; especially if you have lowlights and highlights. The levels of layers give the hair more dimension which makes it appear fuller. This is a great hairstyle for those with thin hair. A longer bob with layers can be used to accentuate the face and is an excellent option for every face shape depending on how long you cut the layers. Remember, if you have a round face you don’t want layers cut at the chin – you want them higher or lower! A layered bob haircut can be used to open up the face if you twist your layers into curls. Make sure the curls twist away from the face, as this helps accentuate the eyes and is best on round and oval faces. The layers of a razor cut bob can be flipped out, giving the face a more youthful appearance and makes hair appear more full. Razor cuts also add movement and keep hair from looking blocky and unnatural.